It's going to be an epic weekend of xmas shopping at the upcoming Handmade Christmas Markets! We'll be there both days with a larger store and lots of xmas geek themed goodies. Pop this into your calendar - 12 and 13 December 2015, at EPIC Exhibition Park Canberra, 10am - 4pm on both days. There's free parking too! We're going to be at the fabalous Hustle & Scout markets this weekend - yes THIS weekend! Come catch us this Saturday, 2-7 pm, 11 April 2015 at Hangar #47, 8 - 10 Point Cook Avenue. We're one of 60 fashion stalls. Don't forget that the delicious Forage will be running alongside, featuring a range of tasty tasty food. We're excited to be at the Autumn Handmade Markets Canberra next weekend! Please note that the market has moved to the Exhibition Park (EPIC), where there'll be loads of free parking. Please feel free to come past our store and say hello! 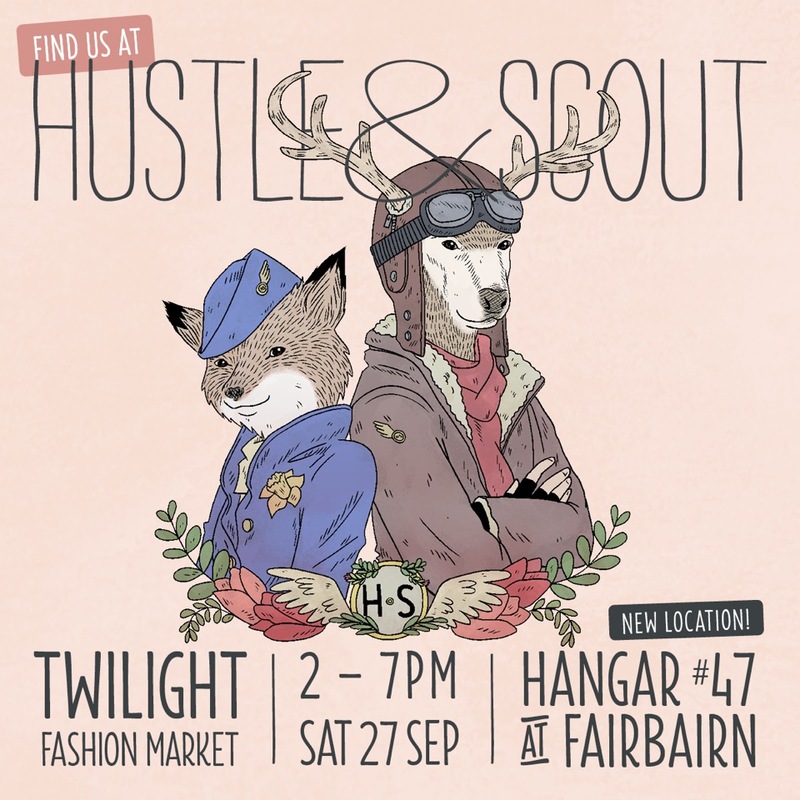 Crankybot is proud to be part of the upcoming Hustle&Scout twilight market on Saturday 27 September 2014. It mixes up two of our favourite things - design/fashion and food! Come along and say hello. The market runs from 2-7pm and will be in Hangar #47 at the airport. We're pleased to be part of the Handmade Spring Market 2013! The Spring Handmade Market will be held on the 5th and 6th of October 2013 at the National Convention Centre in the ACT. Over 150 hand-selected designers from around Australia are booked to showcase their current collections and latest designs. As always, we'll have our molecule range of jewellery, the climate viz jewellery and a number of our favourite science and geek pieces. There is free entry into the market and $2 undercover parking, or park for free across the road. Please pop past and say hello! There's free parking located in front of the National Convention Centre, or $2 all day parking under the National Convention Centre. Crankybot is super pleased to be part of the next Handmade Market Canberra. The markets are a great Canberra institution - we've been attending (and buying heaps of awesome stuff) since the start of the markets a few years ago. The next Handmade Market Canberra will be held on 8th and 9th of December at National Convention Centre,31 Constitution Ave Canberra. Please come past and visit our stall. It's a great opportunity to do all of your Christmas shopping in one spot as there's lots of great designers there! You can also pre-order your favourite Crankybot item and save postage by picking it up at our Handmade Market Canberra stall. Please get in touch if you woud like to do that. CrankyBot was excited to be part of the Arts, Not Apart festival this year. We had lots of people come past the stall to say hello and to buy various science and geek things. We showed people our data visualisation pieces (our expression of art and science!) and talked about being able to see changes in weather when data is materialised into this type of physical form. 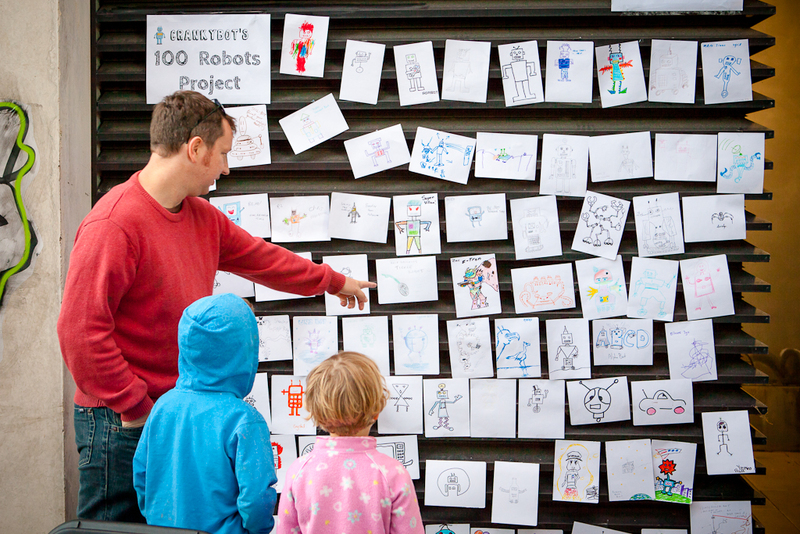 We're also pretty pleased with the number of people who took part in our 100 Robots Project. While we were a few robots shy of a 100, we did get a great range of robots. We love the diversity! We're going to be announcing the winners of this collaborative drawing project shortly. Alastair and I are having difficulty picking the winners from the large range of very awesome robots! I also managed to get a quick squiz around at my follow artists. There were so many great art pieces and performances pieces going on. If only I had more time to check them out. My take away from all of this? Make sure that you pop along to the next Arts, Not Apart festival and see the diversity of local talent. You can check out the rest of my (very small number of) photos from the Arts, Not Apart event on flickr. 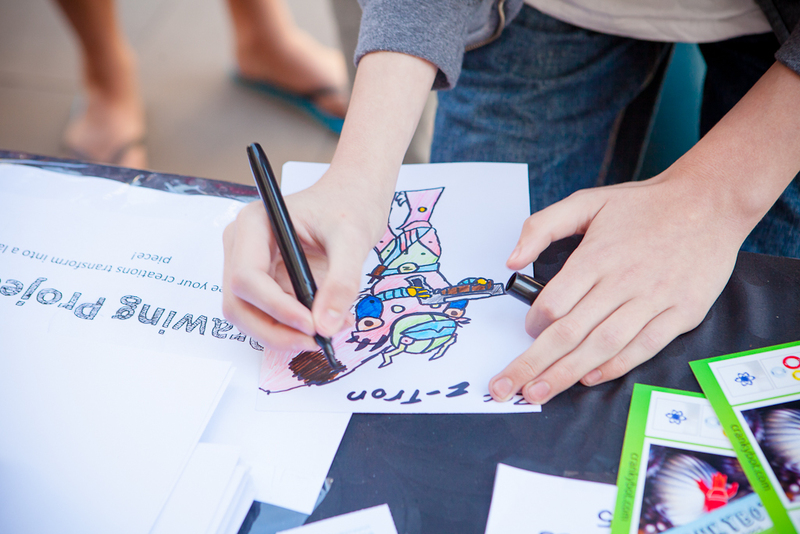 CrankyBot will be at the Art, Not Apart festival this Saturday 27th October 2012 at New Acton, Canberra. The Art, Not Apart festival is a multi-arts festival featuring musicians, poets, painters, sculptors, dancers, filmmakers, street artists, weavers and more. I'm looking forward to the suitcase rummage and the street artists (there's even a paste up competition). It's a free event for all ages. Starts at 1pm and goes until 7pm. By the way, the Art, Not Apart poster image that's accompanying this blog post is done by the talented Natalie Mather. CrankyBot will be showcasing our data viz pieces (check out our Solar Viz necklace as an example), along with a range of our hand made science and geekery laser cut goodies. We'll also be running a 100 Robots Project where the goal is to create 100 robot drawings by the end of the day. We'll pick a few of our favourite robots to be lasered into a piece you can wear. So please pop past, say hello and come take part in our 100 Robots Project. Today marks the birthday of Niels Bohr, a Danish physicist received the Nobel Prize in Physics in 1922 for foundational contributions to understanding atomic structure and quantum mechanics. We've loving Google's doodle of Niels Bohr's 127th birthday! To celebrate Niels Bohr's contribution to science, we've just released the Bohr model atom necklace, our latest addition to our science jewellery. We hope you like it!